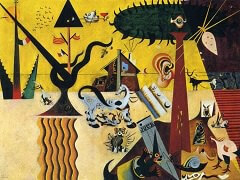 This great mural in the Guggenheim Museum opened up a new path for Miro, enabling him to leave behind the style of the 1940s which had made him famous but which had also narrowed him down. 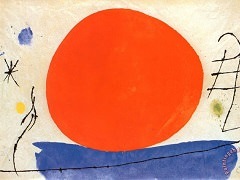 Miro wanted to move away from his "trademark" and find a new openness that at first expressed itself in new oblong formats. 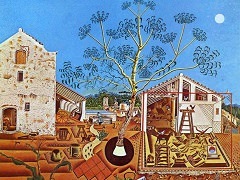 He painted this picture directly, without sketches, and relied completely on the broad movements of his first impulse. 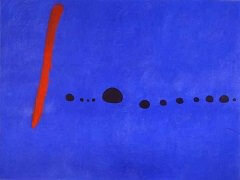 Set against an emotionally charged surface of blue and brown spots are some eruptive red and black beams that form vague figures and are linked together by some brief symbols. 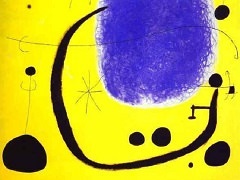 The figures were subsequently filled with glowing zones of colour - areas in which the familiar magic of Miro's cosmos could unfold. Some little twirls of colour and rows of dots form three mythical creatures. 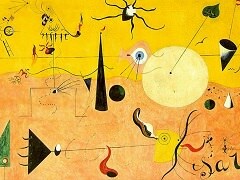 As an additional decorative element Miro then scattered some short rows of dots around the figures and constellations. 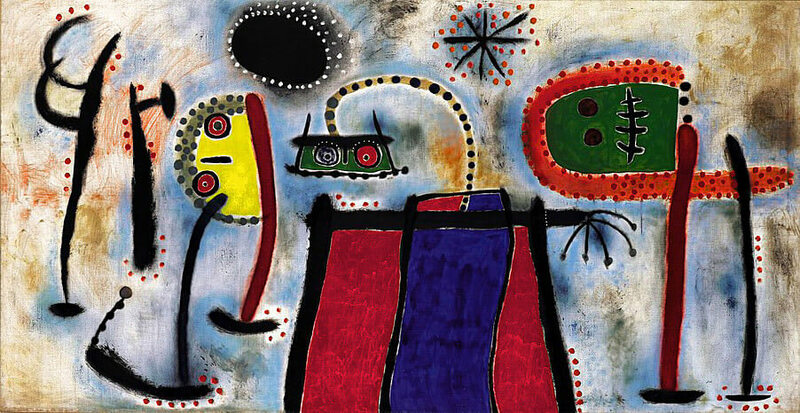 The spontaneity of the symbolism makes this painting appear rather crude and less well-formed than Miro's previous pictures. The expressiveness of the symbols is therefore of a different kind altogether. Their expressive energy imprints itself onto the surface like writing on ancient stone plates.